On 13 December 2017, Kyrgyzstan hosted its first training on global health diplomacy in Bishkek. The event was the result of fruitful cooperation between the WHO Country Office and the Diplomatic Academy of the Kyrgyz Republic. Participants included high-level representatives from parliamentary, presidential and governmental offices as well as departments of the Ministry of Foreign Affairs and Ministry of Health, affiliated health and academic institutions, and United Nations agencies. 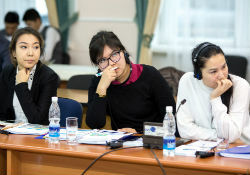 The training celebrated the 25th anniversary of Kyrgyzstan’s membership with WHO, and also commemorated Universal Health Coverage Day on 12 December. It offered a perfect venue for discussing key concepts and priorities in global health diplomacy in the current international context, and the role of Kyrgyzstan in the central Asian region and beyond. The training’s format and unique agenda were developed in close collaboration with the Graduate Institute of International and Development Studies in Geneva, Switzerland. Attendees learned about negotiating for health issues through presentations by experts from WHO/Europe, including Dr Haik Nikogosian (Special Representative of the WHO Regional Director for Europe), Dr Richard Alderslade (Senior Policy Advisor), Ms Monika Kosinska (Programme Manager of Governance for Health) and Dr Jarno Habicht (WHO Representative in Kyrgyzstan and Head of the WHO Country Office). Speakers focused on how diplomacy relates to the interface of health, foreign policy and development, and how global health policy challenges are being addressed by different groups and at different levels of governance. political and economic fora as venues for global health diplomacy. In their opening remarks, Mr Seit Ubukeev, Head of the Department of International Organizations and Security of the Ministry of Foreign Affairs, and Dr Talantbek Batyraliev, Minister of Health, pointed out the importance of the training for both health and foreign policy sectors. This capacity-building training was tailored to representatives of the ministries of health and foreign affairs, of the Government, and of international organizations and academic institutions who engage in health negotiations using diplomacy. It aimed to deepen their understanding of the dynamics of global health governance, and to reinforce their negotiation skills on health themes.